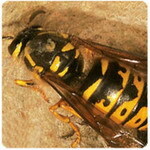 The queen wasp emerges from hibernation around the middle of April. She makes the first cell from chewed bark and saliva which is smaller than a golf ball. Within individual chambers she lays around 10 to 20 eggs feeding on insects and other invertebrates. 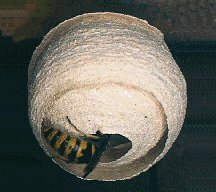 By summer a normal wasp nest could contain up to 6000 individuals. Old nests will not be re-used but a new nest may be built close to the old one if it is in a favourable site. Wasp stings can be very unpleasant and for some it can prove fatal. The insects venom can produce an allergic reaction of 2 types: respiratory obstructure or anaphylacticshock syndrome, this can cause vascular callaps, breathing becomes shallow, the pulse is almost undetectable and a victim can quickly loose consioness. 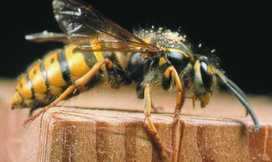 Death from wasp stings is rapid compared to snake venom. 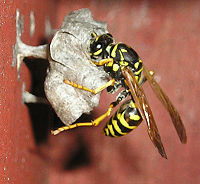 One phone call to Duncan Ross and any wasp nest can be eradicated usually within 24 hours.